Malaysia’s waste is increasing at alarming rates. Illustration by Lyn Ong. Malaysia is well known for great food. We’re proud of the diversity, affordability and tastiness of our food – all things that we Malaysians are quick to brag about. Unfortunately our unique food culture is also turning into a culture of waste. 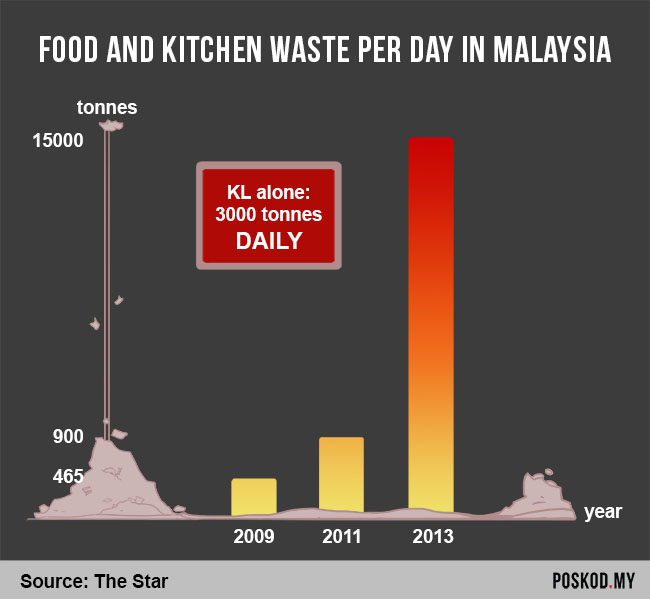 With a steady rise in population and a frantic race towards “developed” status, Malaysians are now known to be food wasters, where it’s estimated that we throw away a shocking 15,000 tonnes of food and organic waste a day. It’s hard to believe just how much our food waste has increased in just a few years. According to a report by The Star last year, our food waste averaged at around 450 tonnes a day in 2009. That number doubled in 2011, and in 2013 we multiplied that amount 15 times. We are now throwing away 15 times more food and organic material compared to just four years ago. These statistics are disturbing, especially considering that amount of wasted food can feed 7.5 million people a day. 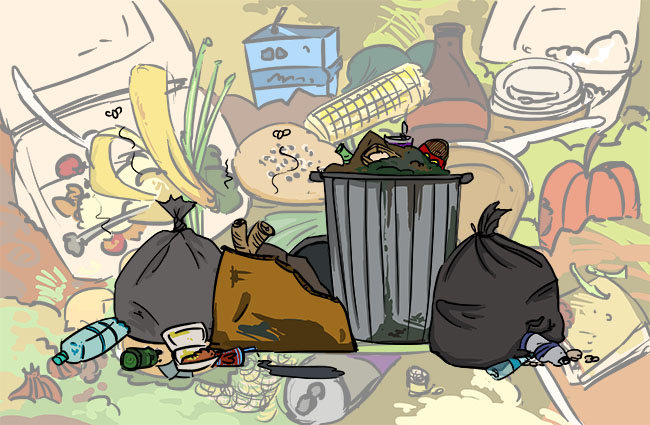 Malaysian food waste has increased by more than 15 times between 2009 and 2013. 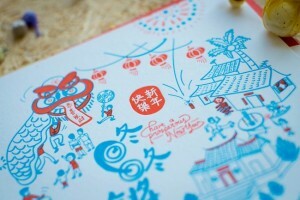 Infographic: Lyn Ong. On top of that, we Malaysians celebrate several festive seasons a year. With Ramadan coming to a close and Hari Raya Aidilfitri around the corner, we decided to find out how seasonal eating patterns affect food waste. So we contacted Core Competencies, a company which owns Recyclenergy, Malaysia’s first waste-to-energy plant. Privately owned and privately funded, the waste facility in Seminyih, Selangor, is designed to achieve twin objectives of environmentally friendly Municipal Solid Waste (MSW) disposal, while generating renewable power in the process. We spoke to Kamarul Zaman, President of Core Competencies. During Ramadan, food waste actually increases by 10%. 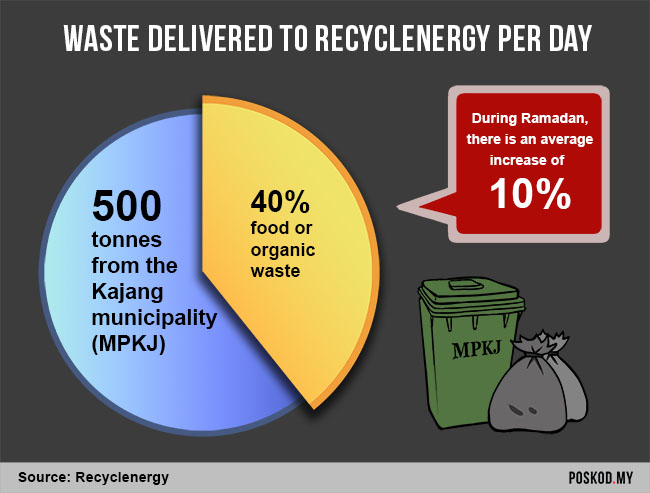 According to Kamarul, Recyclenergy receives around 500 tonnes of waste a day from the Kajang municipality (MPKJ), and 40% of that amount is food or organic waste. Kamarul revealed that during Ramadan, this amount actually increases by 10%. Ironically, in a month of reflection and restraint, Malaysian buka puasa habits actually lead to more food waste than usual. Kamarul adds that food waste also includes other festive and religious seasons such as Chinese New Year and Christmas, but the impact of Ramadan is particularly noticeable because it lasts longer. “During Chinese New Year we might see a 10% increase over a week or so, but with Ramadan the increase lasts at least a month,” he explains. 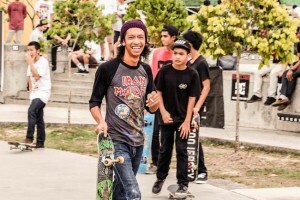 Malaysia’s development is changing how we consume. Kamarul points out that modernisation has also contributed to more plastics being used (as oppose to banana leaves and other natural sources for food packaging), as well as providing an abundance of factory made foods that we take for granted. A lot of this ends up uneaten, in the trash. 500 tonnes of waste are delivered to Recyclenergy from MPKJ every day. Infographic: Lyn Ong. We met up with Adeline Zainuddin, 24, a law graduate who decided to temporarily leave the world of suits and ties and try her hands on being a pasar Ramadan vendor at Jalan Bukit Bintang. She and a group of friends opened up a roti jala stall. When asked what they do with the extra food when the bazaar closes for the day, she says that they don’t have excess of food often and even when they do, it wouldn’t be a lot because they would make the delicacy as and when people order, unless they anticipate a lot of customers, such as during peak hours 5:30pm to 6:30pm. “We will barter with the two stalls next door,” she says, referring to a grilled lamb stall on their right and a nasi tomato stall on their left. “They would give us a lamb chop for two roti jala, and the stall next door would give a pack or two of nasi tomato, we sometimes make a fresh batch,” Adeline explains. Adeline says she will also offer food to the homeless people who sometimes beg from the stalls at the pasar Ramadan. Sure enough, during the interview, an old man came to the stall and extended his hand in hopes of charity. However, he declined when a box of roti jala was offered to him and he took off to find other sources of sustenance. Regarding her concerns about food waste management during Ramadan, Adeline says it’s almost becoming a part of life. “Malaysians litter and from that attitude we get problems like food wastage,” she sighs. Syamee Syamsul is a chef at a convention centre that caters for a lot of events, including Ramadan buffets. “Food wastage is really a problem. 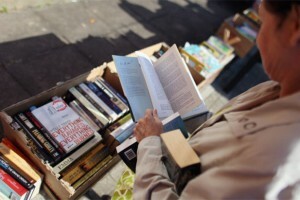 It’s a problem for us because it wastes money and that’s not good for business – the wasted food could have gone to saving the ingredients,” he laments. Syamee has experience working in the kitchens of hotels, restaurants, and convention centres all year round and currently he focuses on preparation in the Malay kitchen in a famous convention centre that opens its doors for iftar. “Sometimes people would take five chickens and only eat two but the biggest wastage will happen when a large group of people cancel at the last minute – like today, 150 people cancelled. Imagine that!” he says. So, what are the steps taken by the management to deal with the food wastage during Ramadan? “The management allows for the staff to take the food for themselves when the lines are already cleared for the customers. This is how we minimise the waste,” he explains. “Also, we allow for people who dine-in to take away the food that’s leftover. We’ll leave some of the food for the cleaning staff should they need it later at night. They can just take it,” he continues. 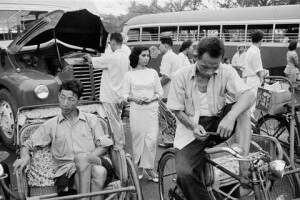 Syamee showed his frustration throughout the interview, expressing that it’s a dilemma that causes multiple problems considering the limited resources at their disposal. Around 50% of food would still left on the buffet table during Ramadan buffets and half of that is usually thrown away, according to his conservative estimates. The United Nations Food and Agriculture Organization (FAO) estimates that roughly one third of global food production is either lost or wasted, draining natural resources and contributing to negative environmental impacts. According to the FAO, global food production occupies 25% of all habitable land, is responsible for 70% of freshwater consumption, 80% of deforestation, and 30% of greenhouse gas emissions. Global food production is considered to be the largest single driver of biodiversity loss and land-use change, only for us to take it for granted while we pile our plates with food that we later throw out. Ramadan is drawing to a close this year, but our national levels of waste continue to rise at alarming rates. As a developing nation, we have increasing access to an abundance of food, but we are not considering the consequences of excess. While celebrating over vast amounts of food might seem natural during any special occasion, it’s time that we – as Malaysians, and as humans – learn that some gut instincts shouldn’t be followed.